Rev Up For Personalized Gifts With Personality! 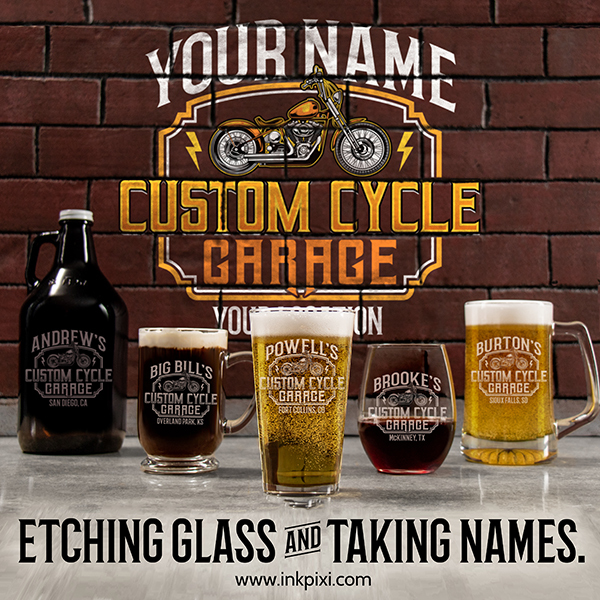 Custom Cycle Garage Design #A627 expertly laser-engraved on custom barware just for you! Do you or someone you know love motorcycles? Are you looking for the ideal gift for your bike-riding buddy? Do you want to give personalized gifts with personality? If you answered yes to one or all of those questions then you are at the right place! With hundreds of designs to choose from, you will certainly find something for everyone on your gift-giving list. Check out our full selection at www.inkpixi.com. Be sure to sign up for our email list so you don’t miss out on special sales and member-only deals!